We're very excited to announce that Impossible™ has arrived at Classified with their new 2.0 recipe that's tastier and more nutritious. We've introdued 5 menu items including Classified Impossible™ Burger, Impossible™ Hot Dog, Impossible™ Mexican Taco, Impossible™ Korean Taco and Impossible™ Poutine. Impossible™ is meat made from plants and made for meat lovers. It contains primarily of soy protein, potato protein, coconut oil and sunflower oil. What's different about the Impossible™ 2.0 recipe? It's juicier, beefier and more nutritious than ever. The new recipe contains 40% less saturated fat, 30% less sodium, higher quality protein and made without gluten. How does Impossible™ impact the environment? It's more sustainable and requires 87% fewer greenhouse gas emissions, 74% less water, and 95% less land than beef from cows. Available now at all Classified locations except New World Tower. We've just launched our new food ordering service Classified Click & Collect on the CIRCL app. Order now and start earning cashback. 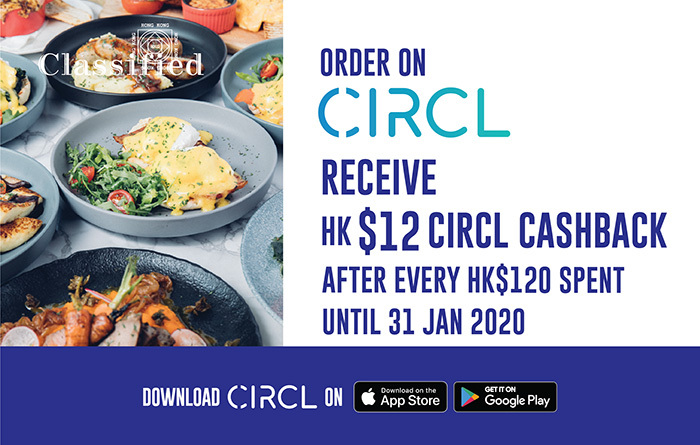 You can now receive HK$12 after every HK$120 spent. Download the CIRCL app for free from the App Store or Google Play. We're proud to be partnering with Les Frères Marchand, experts of cheese with a family long tradition passed down through four generations since the 1880s. Each month, we bring new cheeses for you to discover. *Classified Repulse Bay from Monday - Friday between 5pm - 8pm only.